National Spanish Paella Day is March 27th, but you can make this amazing rice dish any day. There are many versions of paella recipes but what they all have in common is rice, meats, veggies and saffron spice, which turns the rice a beautiful golden color. Spanish Paella originated in the Valencia region in eastern Spain. Classic paella usually is made with rabbit, chicken, snails, beans, and artichokes and seasoned with saffron and spices. Still hugely popular in Spain today, the recipe for paella has expanded over the years, and now many different varieties of paella are passed off as authentic. Paella is cooked over an open fire in a traditional paella pan. It is commonly made with rice, chicken, fish, seafood and any veggies you would like. Today, Spanish Paella can be found all around the world. If you order paella outside of Spain you will likely get a rice dish with chicken and seafood. My introduction to Spanish Paella came in October 2014 when my husband and I traveled with family to Madrid, Spain. It was October and the weather in Madrid was absolutely beautiful – ideal for strolling down the streets and eating at outdoor cafes. Here, we found an abundance of restaurants serving tapas and paella, family-style, in festive outdoor patios. Tip 3 – Invest in a real paella pan – a large, flat, open pan that has handles on both sides for easy lifting. We recommend a pan 15” to 19” in diameter. Ingredients: We have organized our ingredients for this recipe by the different prep components, including the brine, broth, meats, veggies, seafood and garnish. BRINE THE CHICKEN – Combine all ingredients and bring to a boil. Stir to make sure the salt and sugar have dissolved. Let cool to room temp. Strain out all of the herbs and discard, keeping the brine broth. Add the cut-up chicken to the brine. Refrigerate for at least two hours or as long as overnight. Remove chicken from broth, drain well and pat dry with paper towel. COOK THE CHICKEN – Coat the chicken with olive oil and sear it in a preheated pan on the stove for 3 minutes. Transfer the pan to a 350 degree oven and cook for about 10 minutes. Set the chicken aside for later. BROTH – Heat the chicken broth with the saffron, paprika and the whole onion. Cover and simmer 30 minutes. Remove the onion and measure the broth — you need exactly 6 cups for later. MEATS – In a paella pan over medium-high heat add the ½ cup of olive oil. Once hot, add in Spanish Salame & Spanish Ham. Cook for 5 minutes. Then add the Chorizo to the pan and stir fry about 10 minutes. (Do not add the chicken). VEGGIES – In the paella pan with the cooked meat, add the chopped onion, scallions, garlic, & roasted red peppers and sauté until the onion is wilted. Add the rice to the pan and stir to coat it well with the oil. Sprinkle in the chopped parsley and the crumbled bay leaves. Stir in the 6 cups of boiling hot broth. Add the wine and rice. Salt to taste. Bring to a boil and cook uncovered, stirring occasionally, over medium high heat about 10 minutes. Add the cooked chicken and bury it in the rice. SEAFOOD – Add the clams and the mussels (or other seafood) with the edge that will open facing up, pushing them into the rice mixture. COOK MIXTURE – Scatter the paella with the artichoke pieces, then bake at 325 degrees F, uncovered, for 20 minutes. If using a grill outside, close the lid and grill for 20 minutes. GARNISH – Remove paella from the oven/grill and let sit, lightly covered with foil, for about 10 minutes. Before serving, decorate with lemon wedges and chopped parsley. What does authentic Cuban Paella look like? My girlfriend Michele in Florida hosted a Paella party featuring Seafood Paella and Meat Paella. This looks spectacular! 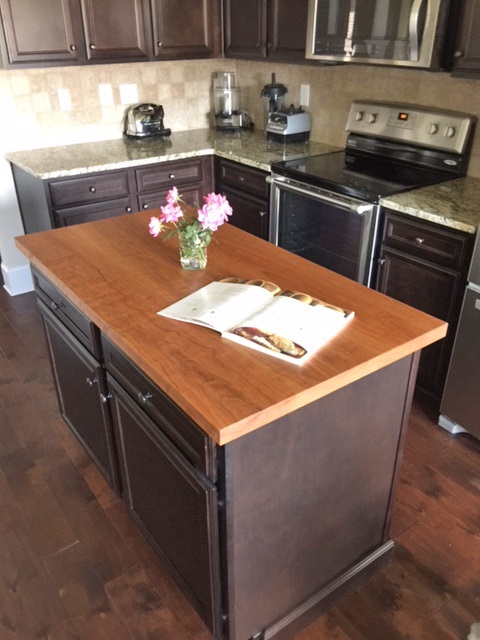 We love getting customer photos showing off the new Butcher Block Co. countertops and furniture in their homes! Our feature photo above highlights Walter’s New York kitchen with a Butcher Block Co. brand maple edge grain countertop inset into his quartz island countertop. The blending of natural materials like wood and stone helps to showcase the individual textural and color differences. In Walter’s kitchen renovation, it resulted in a clean, bright, and modern space. Very trendy and gorgeous! Homeowners who are remodeling their kitchens are paying quite a bit of attention to countertops. Countertops are the most common kitchen upgrade (94 percent), followed by sinks (89 percent) and backsplashes (88 percent). And countertops are the top feature (at 42 percent) on which home renovators are willing to spend a little extra. The U-shaped layout of kitchens is no longer the most popular option (32 percent), as the L-shaped layout has made a comeback over the last two years (35 percent). Finally, the study revealed that 75 percent of renovating homeowners are obsessed with clutter-free countertops, preferring a more minimalistic appearance. Our customers typically order butcher block tops to serve as either kitchen island tops or kitchen countertops. Our John Boos custom tops can be ordered with stove and sink cutouts, scrap hole cutouts, miter cuts and angle cuts. Other creative uses for our butcher block tops include laundry room counters, office desks, table tops, bar tops, workshops and more. (Check out our blog for other Creative Uses for Butcher Block). John Boos countertops come in standard and custom sizes, in four species of wood: Maple, Walnut, Cherry and Oak. The most popular grain styles are edge and blended grain, but traditional end grain is available, too. Butcher Block Co. brand countertops are custom made to your dimensions and offer you 15 different wood species from which to choose! They are also available in end and edge grain, but the most trendy selection is plank-style tops. 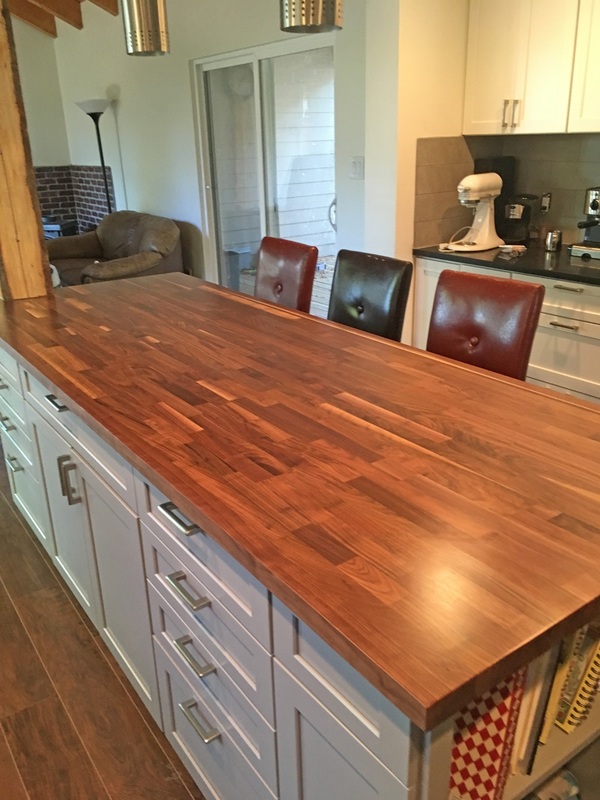 Visit our Happy Customer Photos Gallery to learn more about the butcher block you see below. Our customers love their butcher blocks. Many folks invest a great deal of money in their cutting board, butcher block table, or countertop, so it goes without saying that they will want to protect their investment with proper butcher block care. And proper care means oiling your natural finish butcher block once a month! MOISTURIZE butcher block with a food-grade mineral oil once a month to keep it from drying and cracking. We recommend you first apply a coat of John Boos Mystery Oil . This mineral oil based product will penetrate deep into the block, moisturizing the wood. PROTECT butcher block by applying a beeswax board cream to lock in the moisture and provide a protective barrier. After the mineral oil application, apply John Boos Beeswax Board Cream to lock in the moisture and leave a silky, wax barrier on the surface of the wood. This one-two punch, using both oil and cream, is an especially effective maintenance regimen. Now, it is even easier than ever to extend the beauty and life of any butcher block with this no-mess mineral oil applicator. Use it to apply both block oil and cream to your butcher block every 4 weeks. Visit our Butcher Block Co. Help Center for more information on care and repair of butcher block. E-tailer Butcher Block Co. announced this week the addition of live-edge cutting boards to its online store catalog. These boards – available in either maple or walnut – will be supplied by Created Hardwood, LTD. In September BB Co. began selling live-edge table tops reclaimed and refinished by Created Hardwood, headquartered in Central Ohio. Brothers Phil and Jon Hicks, along with their father, recently founded Created Hardwood Ltd. In response to consumers’ yearning for simpler things and a return to Nature. As Phil Hicks points out, “Today, mass production is almost anathema. In contrast, each live-edge board is truly unique – a genuine one-of-a-kind creation. You can’t help but closely inspect a live-edge board, which exhibits the bare exterior of a tree once its bark is removed. In a way, it represents a small sampling of Nature. Not only that, you can make good use of it in preparing and serving meals. How can you beat that?” Hicks queried? About Butcher Block Co. – BB Co. is a leading online distributor of John Boos butcher block products, such as countertops; kitchen islands, tables and carts; cutting boards and chopping blocks. The e-tailer also carries Boos’ commercial line of steel kitchen equipment, plus rolling kitchen islands made by Catskill Craftsmen and assorted specialty items, including knives, knife blocks and serve ware made by niche manufacturers. America Recycles Day is November 15th. In honor of this day, and in the spirit of doing whatever we can every day to help our earth, we have embarked on a project to reuse some damaged butcher block. Reuse is the practice of using something again, whether for its original purpose or to fulfill a different function. We acquired some large commercial butcher block tops that were damaged in shipping. When they were returned to us they were extremely beat up and would have been destined for scrap. But not in this house! I would say we have great vision and can see value in many things other folks discard. This 8′ x 4′ x 2.25” Edge Grain Maple Butcher Block had gouges, cracks and scuff marks, yet we knew it could be given new life. My son, Ben, is now in his senior year at ASU majoring in Industrial Design. One of his projects this summer was to research and design kitchen islands. He came up with a unique design for a bar height kitchen island made with angle iron, rebar and butcher block. He calls this industrial style island the “Truss Table.” We knew we could reuse this damaged butcher block to serve as the top and base of his new table. Step One – Prep the butcher block. The first step was to repair the cracked butcher block. Using gorilla glue and bar clamps we successfully pulled the laminated rails back together. Then using the table saw, we cut the large butcher block down to the desired size for the 72″ x 36″ table top and the beams to make the base. Given the damage on the top was significant, we ran the butcher block through a surface sander. Then we finished sanding by hand with an orbital sander using 80 grit to 150 grit paper. All edges were then eased. Step Two – Build the frame and base. This was the first time Ben welded and he taught himself while welding the frame together. He cut the angle iron legs to size and all metal was sent to be powder coated in black matte. While that was being done, he then built the wood foot rest/base of the table. To create the “truss design” with the rebar, a special jig was made to make certain the angles drilled into the base and table top lined up correctly. Step Three – Stain and Finish the wood. Hard Rock Maple has a very tight grain and is difficult, if not impossible, to stain…or so I thought. However, we discovered a product called a “dye stain” that works extremely well. This product is water based and only required one coat to give this blonde maple top a rich cherry color. The only thing we noticed was that it raised the grain a bit, which we dealt with during finishing. Our new favorite top coat is General Finishes brand Arm-R-Seal Oil and Urethane Top Coat. We applied a coat and let it dry. Then we used 0000 steel wool over it to help smooth the raised grain. We repeated this 2 more times, with finish and steel wool. The final coat (4th top coat) was then applied (do not steel wool over the last coat). The resulting top was as smooth as glass! Step Four – Assemble the table. Given the table was designed to spec in Solid Works, prior to building, when it came to assembly, it was straightforward and only took one hour to assemble completely! Ben would agree, that designing and building your own table may not pay much given all the hours it takes, but the satisfaction in creating a one-of-a-kind table is well worth it. And we reused butcher block that would have been wasted and reused angle iron and rebar from the scrap yard. A job well done! BONUS – Maple Butcher Block Work Bench. A second butcher block arrived totally broken in half down its length. We were able to reuse the smaller piece and transform it into a workbench 8′ x 2′. A chamfer edge and urethane top coat made this workbench good enough to eat off of! This week, Butcher Block Co., a leading online retailer of wood countertops and kitchen furniture and accessories announced it has added to its catalog live edge wood slabs for use as table and counter tops. These wood slabs, salvaged from downed trees and refinished by Created Hardwood LTD in Central Ohio, typically feature live edges on both long edges of each slab to deliver a hyper-natural look. “Furniture with live or natural edges is gaining popularity among both interior designers and homeowners,” says Phillip Hicks, a cofounder of Created Hardwood. “Nothing showcases the natural beauty of wood better than live edges, so furniture designers and woodcrafters are finding ways to incorporate them into furniture of all types – dining room tables, coffee tables, headboards, desks, you name it,” Hicks explained. Until now, Created Hardwood has principally relied on furniture stores and countertop installers to get their live edge table and counter tops into homes and businesses. Seeking to tap into the rapidly growing online furniture market, Phil and his brother Jon Hicks – also a company cofounder – searched for an established E-commerce business already selling wood table and counter tops. The brothers’ search led them to Butcher Block Co. – a destination site for buyers of butcher block counter and island tops and kitchen and dining tables. “Created Hardwood typically has over 100 slabs available for sale at any time,” boasts Jon Hicks. “Over half of all slabs on hand are maple, and our second most popular species is walnut. We also carry slabs of ash, cherry, sycamore, pin oak and willow. Most slabs are between five and eight and a half feet long, typically two to four feet wide and about two inches thick,” he continued. Created Hardwood also offers metal bases for their live edge wood-slab table tops. Shoppers have eleven models to choose from, in designs that span traditional, classic and contemporary styles. The underside of the wood slab will come with holes pre-drilled, making assembly easier. Hardware is included. BBC’s Marketing & Operations Vice President, Kathleen Grodsky, feels that Created Hardwood’s products are an excellent fit with BBC and market trends. Demand for live edge wood furnishings continues to grow, in part because each item is unique. Our customer will be able to match any one of dozens of one-of-a-kind slabs with any of eleven different table bases, so there’s virtually no chance he or she will ever encounter a table that looks exactly like his or hers. According to Ms. Grodsky, BBC will also promote Created Hardwood’s metal table bases for use as supports beneath John Boos butcher block tops, as well as BBC-brand butcher block and plank-style tops.